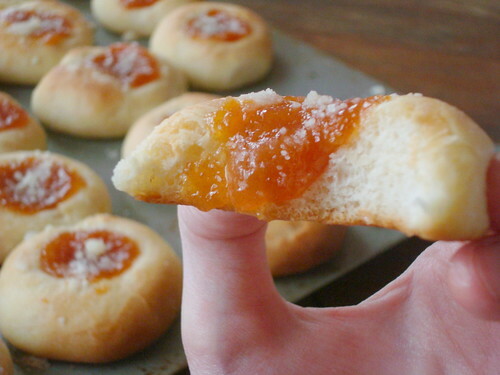 Persimmon Kolaches | bake me away! Having grown up in Texas, I can’t remember the first time that I had a kolache. The filled, yeasty buns were introduced by Czech immigrants and can be found at many roadside stops, such as the Czech Stop in West, Texas. If you had never heard of kolaches, you can read more about them and their history in this recently-published NY Times article. 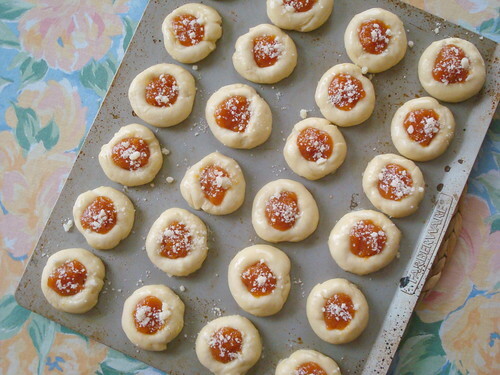 Kolaches weren’t part of any family traditions despite having Czech roots on my mom’s side. I mainly remember my grandpa making cabbage rolls as well as a flat bread that was essentially mashed potatoes and cheese baked between dough from a hot roll mix. No idea if the bread was a “thing” or just a (brilliant) cheesy carb fest, but I miss it and need to try to recreate it. While I don’t have a family recipe for kolaches, fellow AFBA member Dawn Orsak of Svačina Project does. She focuses on the Czech heritage in Central Texas, so it’s no surprise that she was interviewed for the aforementioned Times article. 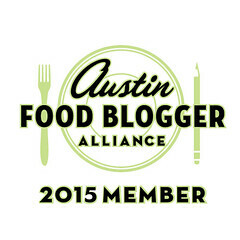 You can find her recipe in the gorgeous Austin Food Blogger Alliance Cookbook. 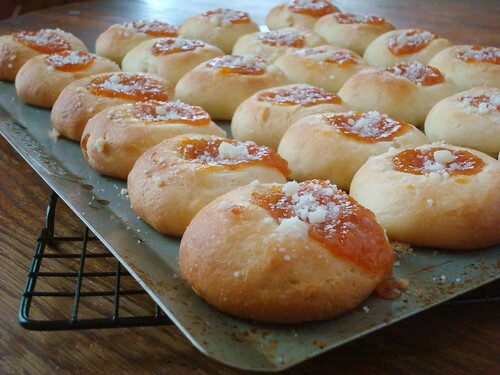 I went to the cookbook potluck last year and of all the things that I tried, the kolaches were my favorite. Lisa of Full and Content used Dawn’s recipe to make Loquat Kolaches, which she donated to the Austin Bakes for West bake sale last spring. I have to say that her use of a less common seasonal fruit filling inspired me to fill mine with persimmon jam. I know, persimmons are a lot more mainstream than loquats, but they’re not apples or pumpkins, and I hadn’t baked with them before. 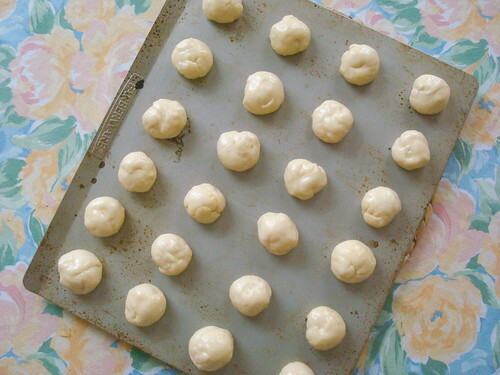 The dough recipe is pretty straightforward if you’ve baked with yeast. However, as Lisa mentions, it makes 48 instead of the stated 24 kolaches. As a result, I halved it because 48? Yowsa! Also, I quartered the posipka (butter crumbles) recipe and still had way more than needed, so the rest is in the freezer for future kolache batches. These were really soft and delicious, perhaps partly due to the amount of butter used: it’s in the dough, on the dough (three coats! 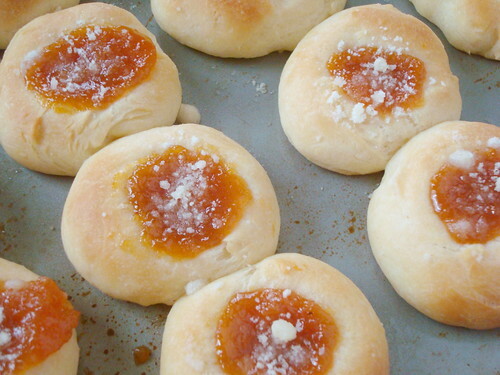 ), and sprinkled over the kolaches. When my grandpa ate bread or even donuts, he would butter every single bite. Coincidence? 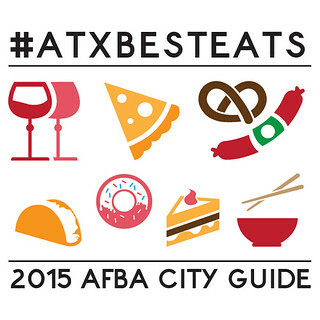 from Austin Food Blogger Alliance Cookbook, pages 40-41. I have to admit that I got persimmons in a past CSA box & didn’t know what they were. I never got around to eating them…finding anything to do with them. Now I feel silly. I must right that wrong in the future…or at least give them to you next time. Ha! I seem to remember plans for a persimmon margarita. You should do that next time, but I’d be happy to help with the drinking. Thanks for the shout out! I’ll bet the persimmon filling was fantastic. I need to try that sometime.